In this settings page, you can configure all available options for the Monkey parser. 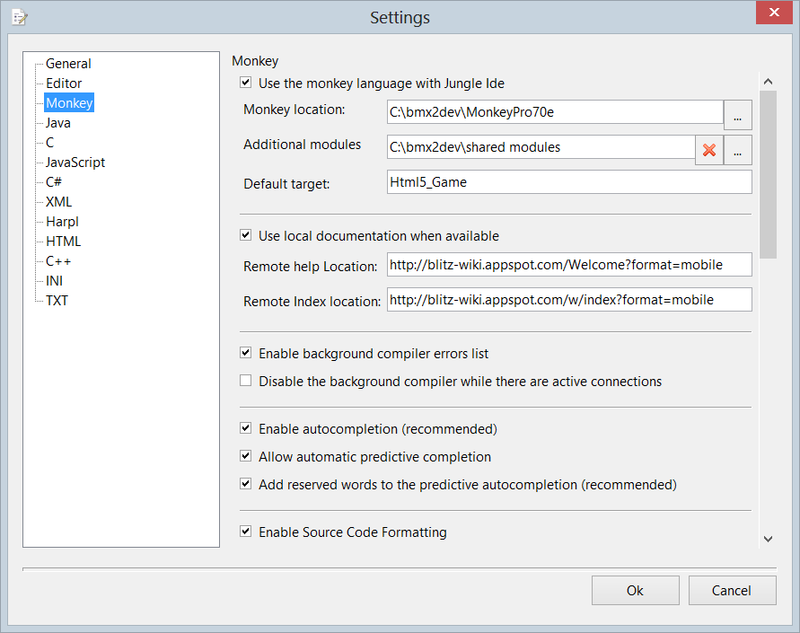 Select this option to be able to use the Monkey programing language and its compiler from within Jungle Ide. This setting does contain the folder where the monkey package has been installed (unzipped) in your system. This folder has to be a valid folder in your file-system. You can set here an additional modules folder. Jungle Ide will make this module folder available to the Monkey compiler, and will provide intelliprompt for any module installed at that location. This is useful to have a modules location that is shared among all Monkey versions, so you do not have to keep copying modules from one Monkey distribution to another. Set here the name of the default target Jungle Ide will use for new Monkey documents. Check this to let Jungle Ide use local documentation. This is highly recommended. This option lets you configure the Monkey documentation location. By default, it is configured to show remote on-line documentation, but you can customize this to show off-line docs already installed in your system. As instance, this can be set to point to your docs folder in your Monkey compiler folder. This option lets you configure the Monkey documentation index location. That’s the place with all keywords reference. By default, it is configured to show remote on-line documentation, but you can customize this to show local contents. This option enables and disables the background compiler system. This option will disable the Jungle Ide background compiler when there are active connections, This reduces CPU load when an application is being debugged. This option will enable to automatic code completion. That is, whenever you write something like a new function header, Jungle will complete the corresponding ending text. Enabling this option, Jungle Ide will try to show code completion autolists as you type. This kind of completion includes all language reserved words and all classes, functions, methods and elements defined in the source code. This option will allow predictive auto-completion to use the complete Monkey language known reserved words. By default this setting is enabled. This option allows Jungle Ide to format the spacing and style of source code in a way that it looks the same in the whole document, making it much more consistent when working in group, and also making the source code easier to merge when using version control systems such as Mercurial or Github. Enable this option to make Jungle Ide convert all monkey data-type shortcuts such as $, %, # or ? to their corresponding data type name, such as String, Int, Float or Bool. This makes the code much more easier to understand and read. Enable this setting to let Jungle Ide display a parameter hint pop-up every time you are calling to a function or method. The Jungle Ide Monkey parser includes a pair of combo boxes that display a nested representation of the current code scope position, and allows the coder to quickly jump from one code location to another. Disabling this option will remove this pair of combo boxes form the IDE graphical interface. Enable this option to allow Jungle Ide make some areas of the advanced code parsing in a separated thread. This option will improve performance on a multi-core machine and it is “on” by default. This setting will reduce the amount of parsing required when editing large files, making Jungle Ide much more single-core friendly. This option is only active when multi-thread monkey parser is disabled. This option enables several optimizations on the Monkey modules database, so Jungle Ide can work a bit faster. This option can increase the time required to build the monkey modules database. This option allows Jungle Ide to use the advanced lexed text renderer to draw Monkey source code on the editor window. The Monkey parser loading is usually instant, but it can take some seconds on Monkey installations with thousands of modules source code files. Enabling this option could make a load time a bit more user friendly. by default this option is off. This section allows you to define additional file extensions that Jungle Ide will be able to recognize as valid Monkey source code files.